What do you think you’re waiting for? What we think we’re waiting for is probably nowhere near as good as what God is actually going to give us. The people of Israel were ready for a Messiah; they were desperate for a Savior; they were crying out for a Liberator: one, like David, who would establish the kingdom of Israel in safety and security; one who would usher in a period of the blessing of the Lord that had been promised to Abraham. They were ready for a king, for a charismatic leader, to soundly defeat the Romans and kick them out of the Promised Land, to cleanse the Temple in Jerusalem, and to restore honor and dignity to the people of God. But when we consider the lineage of Jesus in Matthew 1, we spot some familiar names, and behind those familiar names, some familiar stories. There are four women who are mentioned (which in its own right would have been unusual—ancient genealogies were usually only concerned with the male line): there was Tamar, who pretended to be a prostitute and slept with her father-in-law Judah; there was Rahab, a prostitute of Jericho, who harbored the Israelite spies and then bargained for her safety; there was Ruth, a widow and a foreigner, who secured the well-being of herself and her mother-in-law through a marriage with an older wealthy man; and Bathsheba, who’s described here as simply “the wife of Uriah,” which she was even as she slept with King David. But there’s also Isaac, who pretended his wife was his sister so he wouldn’t get killed; there’s Jacob, who deceived his own father to steal his brother’s blessing; there’s Judah, who sold his brother Joseph into slavery, and slept with his daughter-in-law because he thought she was just another prostitute. There’s Abraham, who tried to make God’s promise happen in his own time and caused a rift in his family; and there’s David, finally king, finally the one in authority, who committed adultery, tried to cover it up, and subsequently ordered the killing of one of his most loyal friends. If you were to imagine a Savior of the world, it probably wouldn’t have come out of the mess that is Jesus’ family history, would it? I mean, every single person in his family line is human, shares in the human affliction of sin—some are notorious, their stories widely known; others are less well known but no less sinful. If you were to write the story of the One who would make all things new, you probably wouldn’t have started with a teenage girl, pregnant out of wedlock, whose fiancé knows he’s not the father and is thinking of divorcing her. But what is true and what is remarkable is that God brings beauty out of every situation; God redeems everyone, regardless of their history or where they came from. In every story, in everyone’s story, God brings unexpected good out of broken, sinful, human situations. And what is even more remarkable about what we prepare for at Advent and what we celebrate at Christmas is that God didn’t keep his distance, solving problems by a wave of his hand—God put himself into these broken, sinful, human situations; he entered into the muck and the mire of creation; he became poor, he became vulnerable, he became human. For hundreds of years, Israel had been waiting for a national liberator, a military general; but what God gave instead was the Savior of the world and the Prince of Peace. Since the fall, since the dawn of time, creation had been waiting for its Redeemer, its Restorer; and what God gave was the One who would live his life in such a way and give his life in such a way that all things would be made new. And when he came, it was messy and it was complicated and it wasn’t what was expected. It was better. Martin Luther said, “We pray for silver, but God often gives us gold instead.” And so again: what we think we’re waiting for is probably nowhere near as good as what God is actually going to give us. And so even as we wait for that job or that relationship or that child or that next step; even as we wait for that healing and that reconciliation and that forgiveness; even as we wait for peace in conflict zones and neighborhoods, for health in disease-ridden slums, for families for kids stuck in the foster-care system, for community for single parents struggling to raise their children on their own, for the end of AIDS and poverty and violence and human trafficking and sexual exploitation and all kinds of injustice; even as we wait for the kingdom of God to come and the will of God to be done here fully on earth as it is in heaven, we can rest assured that God has all things in hand, that in the words of Mumford & Sons, “there will come a time, you’ll see, with no more tears; and love will not break your heart but dismiss your fears.” We can rest assured that Jesus, who is the greatest gift God has ever given, came to earth at Christmastime and will come again to bring heaven down to earth. 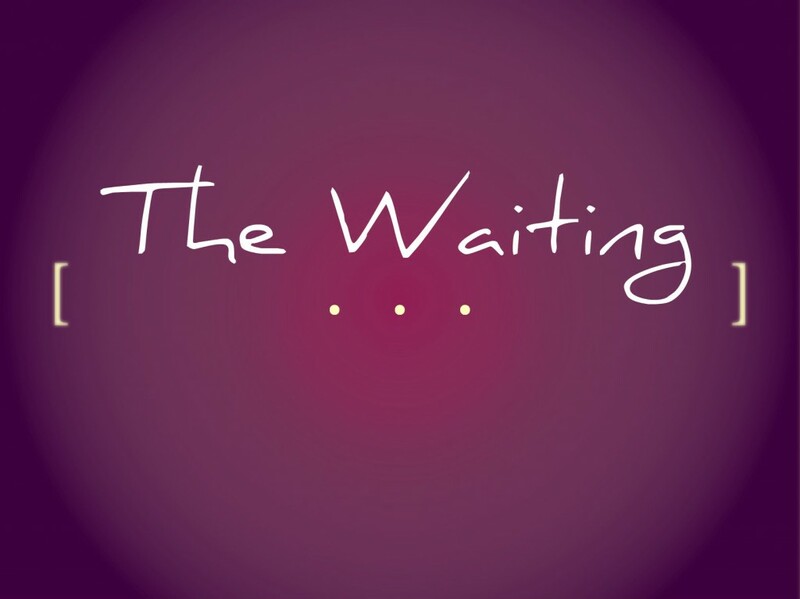 This Advent season that we find ourselves in is about waiting, and so we return to that question I posed at the beginning: what is it that you’re waiting for? Or to be more accurate, what is it you think you’re waiting for? And what is God teaching you while you wait? triumph and failure always go together in the wait of faith. They are the head and tail of the same coin. Show me a person who has had no struggle with waiting, whose faith has known no swings between victory and defeat, and I’ll show you a person who has never really trusted God with his or her life. Maybe, while you wait, you need to acknowledge that there are things outside of your control, that you are ultimately helpless to change that person’s heart; maybe in this wait, God is asking you to recognize your desperate need for Jesus, the only one who can change hearts. Maybe, while you wait, you need to acknowledge that life is not exactly as you want it to be, that there is a striving and a yearning and maybe also an apprehension for what will come next, that you desperately want to be in a relationship or you desperately want to be married or you desperately want to have a child or to be healed from addictions or to be free from your past or that you fear being alone or living an unfulfilled life; maybe in this wait, God is asking you to wrestle with these things and struggle with these things with him, and to stop feeling like it’s all on you to make it happen–it’s not. God knows what you need, God knows what is good for you; so wait on the Lord … he will come through. Next PostNext Too much grace?